Product prices and availability are accurate as of 2019-04-17 02:06:04 EDT and are subject to change. Any price and availability information displayed on http://www.amazon.com/ at the time of purchase will apply to the purchase of this product. 1. Low Speed Masticating Technology: Higher nutritional value. Fruit juice is not oxidized and taste good. 2. Providing a high juice yield - Orange 85-90%, Pear 78-83%, Apple 65-75%, Celery 65-70%, Carrot 42-47%. 3. With this vegetable cutting device, it can slice and shred to help you prepare food easier and become a master in the kitchen. 4. Non-toxic components: All working parts (the stainless steel, silicone components and PEI juicing screw) are made of high quality TRITAN food grade anti-oxidation materials. 5. Certified by ETL and CE. 6. Easy to assemble and disassemble: Easy to use. Accessories are included: Stainless steel slicer & shredder blades, Food guide tube, adjustable food pusher (2 diameters: 2.6 inches and 1.7 inches), and 2 screwing axes. 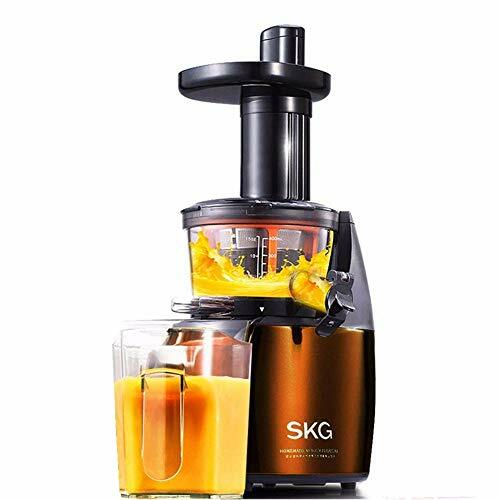 We are Authorized to sell SKG Masticating Juicer, you can rest assured to purchase. 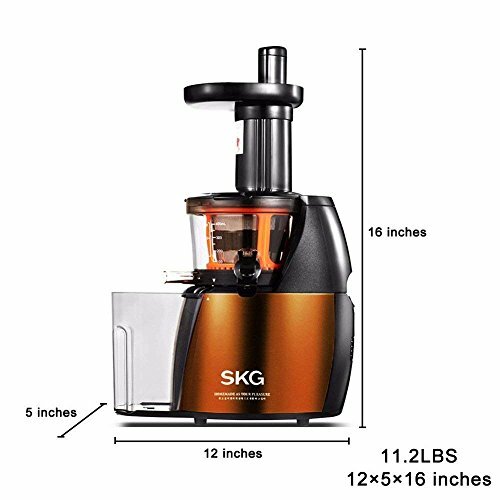 SKG Masticating Juicer is stock at US warehouse; we will ship the products immediately after you place order. 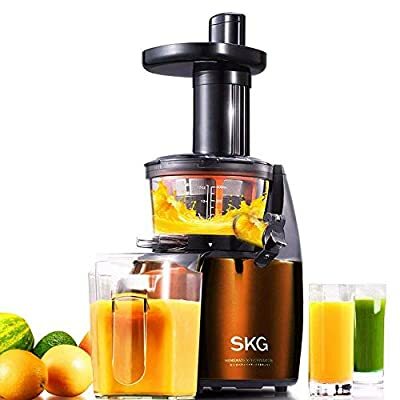 High Quality 150W AC motor with low speed of 65 RPMs squeezes ingredients with minimal oxidation, preserving natural taste & nutrients & enzymes lost by high-speed centrifugal juicers that grind, crush, and heat (from the fast-rotating blade). Our full-nutrition and original-taste juice can be kept fresh for up to 3 days. High Juice Yield With Little Oxidation - High juice yield (Orange 85-90%, Pear 78-83%, Apple 65-75%, Celery 65-70%, Carrot 42-47%).The strainer base and the valve provide a sealed space to hold juice during juicing to prevent oxidation. The valve should be shut during juicing. 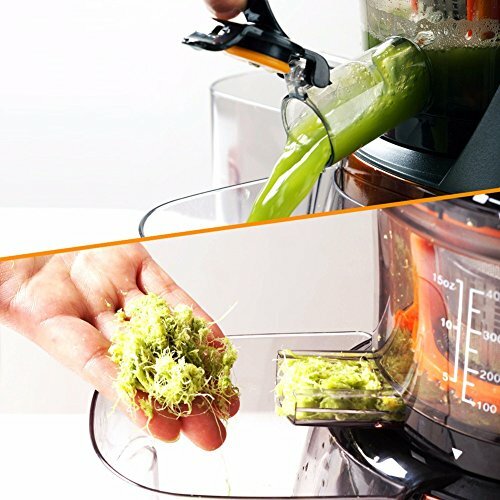 Juicer & Food Processor: The gear-driven, cool-running, high-torque masticating motor works perfectly as the heart of a food processor (Slicer & Shredder) for slicing potatoes, carrots, cucumbers, sausages, etc. 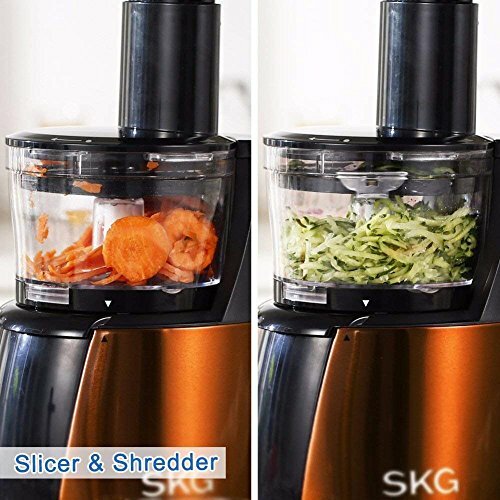 at 0.08-inch thin slice or for shredding food at 0.12-inch small shreds. High-Quality Anti-Oxidation Build & Sealed Valve Further Reduce Oxidation - All parts (the stainless steel, the silicone components and the PEI juicing screw) are made of high quality TRITAN food grade anti-oxidation materials. The product is certified by ETL and CE. Quiet & Space Saving - Low speed motor & single auger delivers quiet and smooth operation. 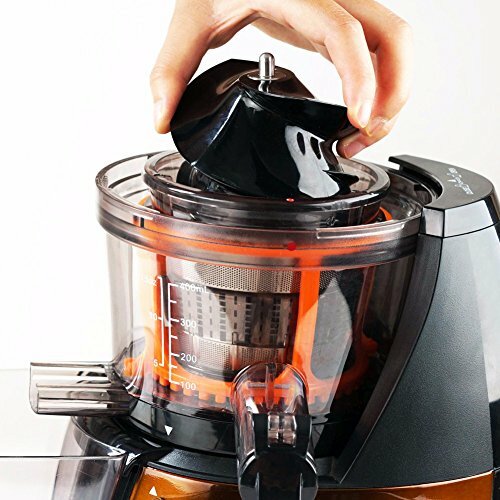 This 11 LBS vertical footprint juicer takes up less space in your kitchen. Easy to Assemble, Operate, and Clean. 1-Year warranty.